Cake, candy, and special treats for the children at Luga orphanage. 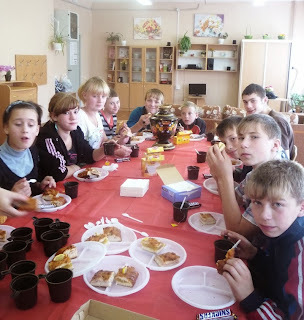 Hot tea is favorite beverage of children in Russian orphanages. 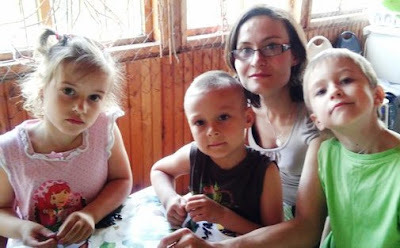 Yes, you can be an important part of Natasha's ministry team for one orphanage in Russia! 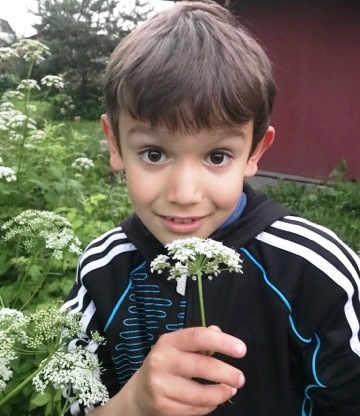 Partner with Help for Children, St. Petersburg, Russia, to take love, hope, friendship, and lots of hugs to children in state-run Russian orphanages. Give clothing items like socks and underwear. 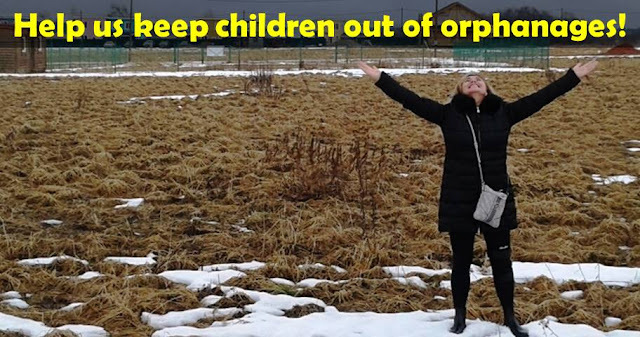 The need to help orphans in Russia is great: over 3 million orphans and children at risk. Without help, an orphan’s future is bleak: prison, violent death, drugs, alcoholism, prostitution, suicide. Photos and occasional videos about the children and ministry to the children. Information about how you can send cards, letters, small gifts to children if you wish. We need your help in the year ahead… will you join with us? You can start with a monthly donation of as little as $5. A donation of just $15 per month provides full funding of ministry to one child. If you decide to discontinue your partnership at any time, for any reason, you may do so. You can donate securely online or through the mail, using your credit card, debit card, bank transfer, or check. Just click on the GO TO button to go to our donation page. We are praying that YOU will join with us in 2017! Follow us on Facebook? Will you click on "LIKE" to help us bring Light, Love, and Encouragement to Russian orphans who have no chance to ever be adopted? Thank you! 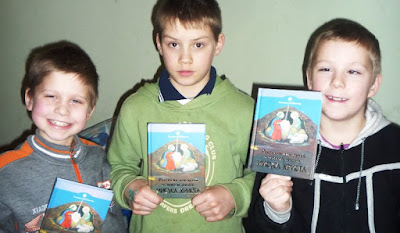 Donate to help Russian orphans. I need your help! Please partner with me to build a new Camp Grace: a Christian refuge for orphans and children at risk! Hello, I am Natasha Kirillova of Help for Children Charity. I need your help! For more than 20 years, Camp Grace has been a haven for orphans and moms who are desperate to keep their children from going into orphanages in Russia. Praise God! Land has been purchased for the new Camp Grace. Now, I need partners for building a camp house on the land. Donate $20 to provide one square foot of the building! Buy a window and window frame: Donate $85 (18 windows needed). Buy a door and door frame: Donate $70 (17 doors needed). Provide the foundation for the building: Donate $2800. Provide one complete room for the building: Donate $3000. Make a donation of any size to help us build the new Camp Grace. Pray for the future of Camp Grace and all who will be blessed at the new camp! We speak of our little summer camp as a “Christian island of happiness and Christ’s love” in the midst of a challenging world. For all the children, it has never been just a drop of fresh air, but a positive surrounding, where they feel loved and accepted by the leaders of the camps. They develop friendship with new people and learn to live and spend time in an atmosphere free of alcohol or drugs. The children live in a Christian family example—with Bible studies and prayer. All those years life at the summer village house brought a lot of fruits into the life of the orphans that we help. The camp became a very important and stable part of our ministry. We do not want to stop. We want to be able to minister to more orphans and their families in need! We want it to become a base for different Christian ministries, our guests, to come and share the love of God with the people who search for it so much! Will you join us in prayer for continuation of our summer camp… with a new location and a new name? Will you help us establish Camp Grace? Thank you for your consideration and prayers! Help Sergei and friends build a new Camp Grace! A haven for orphans and children at risk! Rescue these children! Hello, I am Sergei. I was rescued and did not get sent to the orphanage. I want to help other children stay out of the orphanage. Can you help me? "For more than 20 years, Camp Grace has been a haven for orphans and moms who are desperate to keep their children from going into orphanages in Russia. Thank you for your consideration and prayers!" Celebrate Father's Day! 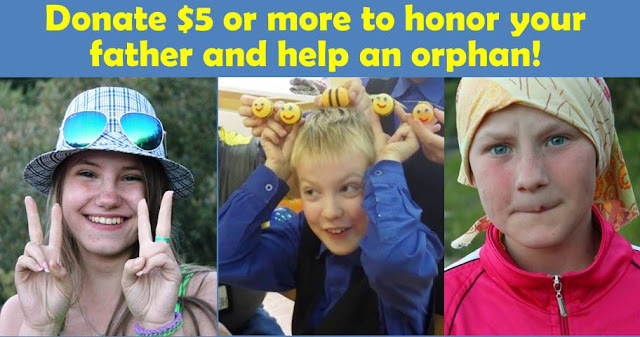 Donate $5 (or more) to honor your father and bless an orphan! We will honor your father on our Facebook page! Celebrate Father's Day by honoring your father with a gift to a child who has no father! When you donate, please list your father's name. We will regularly publish the names of fathers being honored on our Facebook page. Donate now to honor your father! Thank you for participating! Happy Father's Day! Join now to let orphans know you care! Encourage Natasha Kirillova with your sign up today! Your interest and prayers will be a tremendous blessing for us and for the children! Will you help us take the GOOD WORD, love, hope, friendship, and lots of hugs to children in state-run Russian orphanages? Help send one or more orphans to summer church camp! Your donation can change one life forever! Your donation of any size is a big blessing! 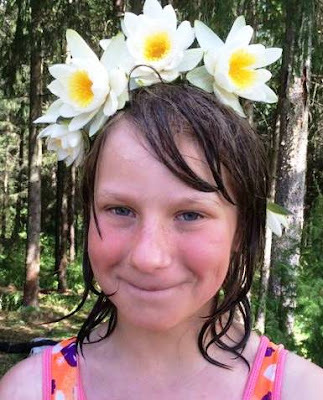 When Alina came to her first church camp, she was angry and bitter. She had witnessed the murder of her mother. Praise God... she accepted Christ as her savior at the 2015 camp, and she is now a new creation! She was one of 14 children baptized at summer church camp 2016. And, now she is so happy... she is now living with her foster family! Help us change more lives in 2017... PLEASE! 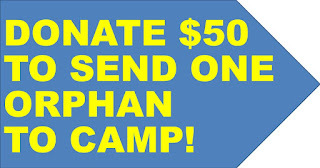 Your donation of $50 funds one child for Camp 2017! If you wish to sponsor more than one child, you can click on the "$5 or more button above" and donate any amount you wish. All donations go through Big Family Mission in USA. You can also write a check to donate. Just indicate "church camp" on your check. You can read more about last year's church camp here: 2016 summer church camp in Russia.